I have a thing for berries and chocolate. This time of year I get excited since you can get fresh cranberries and not only are they beautiful I love cooking and baking with them. 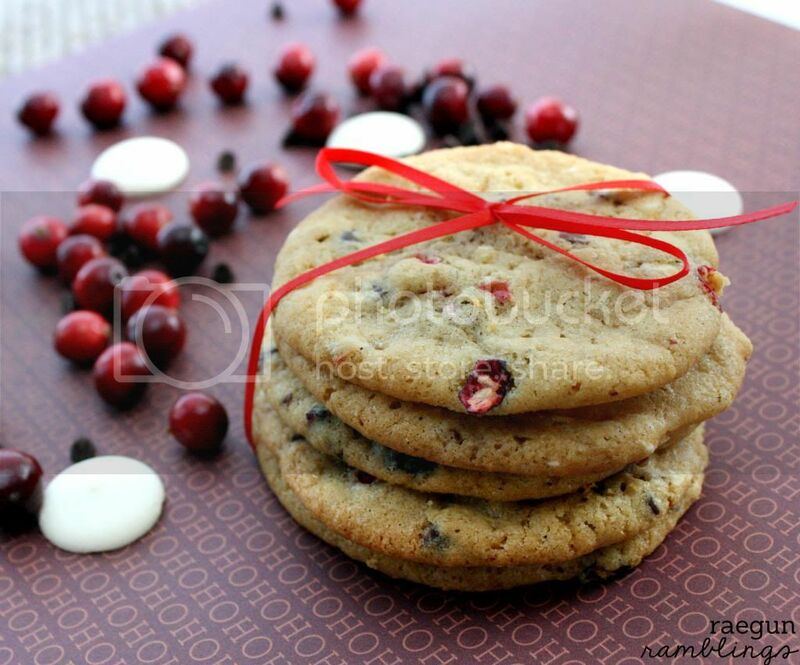 One of my favorite recipes is a simple Double Chocolate Chip Cranberry cookie. It just screams Christmas to me. I shared this recipe before (you know when barely anyone read my blog) so I thought I’d repost it since it really is one of my favorite recipes. Cream butter and sugar. Add the flour and baking soda. Mix in eggs and vanilla. 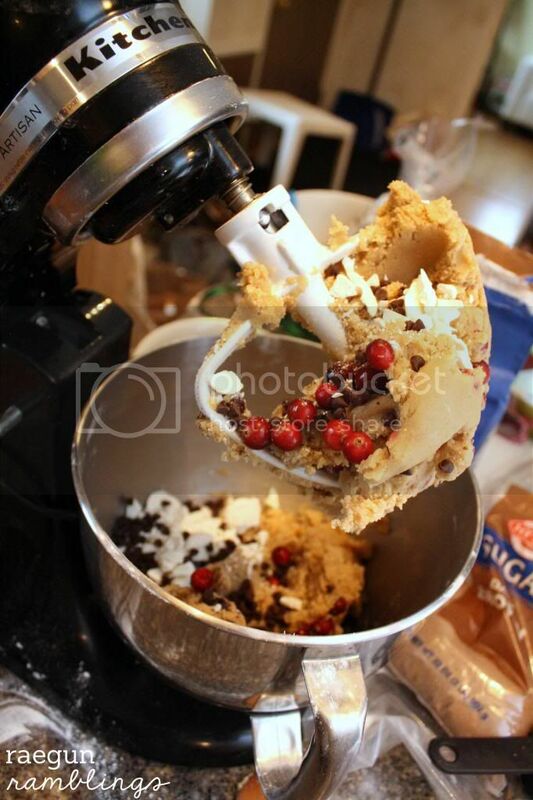 After those are well combined add the chocolate and cranberries. 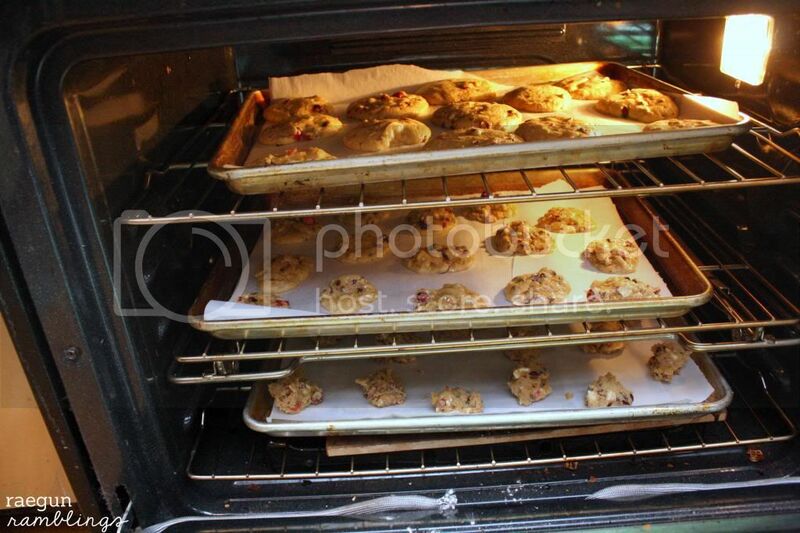 Bake at 375 F 10 to 12 minutes. Makes about 5 dozen. I’ve also used this recipe as a really yummy tweakable base. I’ve substituted the berries and chips for fun alternatives. They aren’t necessarily the prettiest but every time I bake up a batch I get compliments on their tastiness. Enjoy! This recipe looks simply delicious I think I may just have to add these to the Christmas gift baskets I’m making! I can practically smell them cooking they look so good! These look yummy. I love that you used fresh cranberries. Happy New Year! These look amazing! Thank you for sharing at our Pinteresting Party! I’ve done a similar recipe with dried cranberries, but now I want to try this. 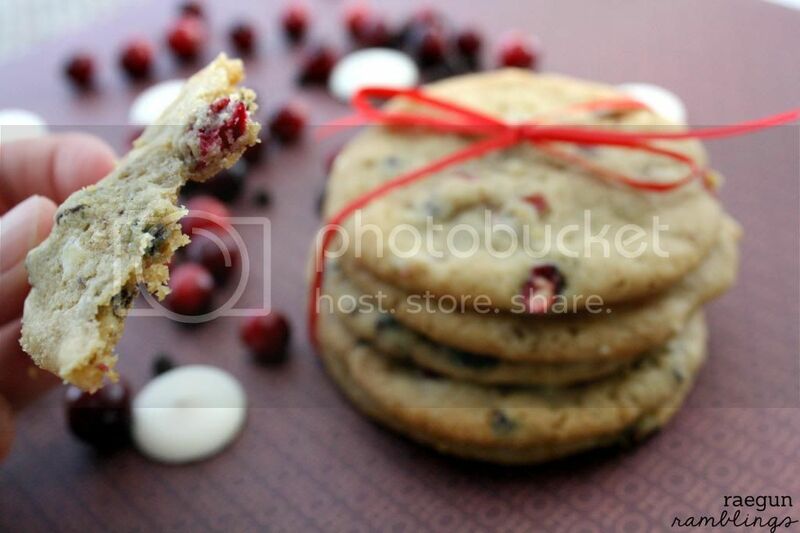 Must pin & make before cranberry season is over!! Oh yes the fresh cranberries are so yummy in it! These look so good. Sorry it took me so long to get to you but you are one of the featured bloggers at Adorned From Above this week. Here is the link to the post. Head over and you can grab your featured blogger button. Just made a double batch!! Made these then also used the base for M&M (left over from Halloween), and chocolate chip! This recipie is great. I try it this christmas and everybody loved it. Unfortunately my cookies wherent so beautiful but still tasty. Marissa, you’re right- these do scream “Christmas!” They are also screaming my name, lol! Question- when you use fresh cranberries, do you chop them up, or just throw them in whole? They sort of looked chopped, but I can’t really tell. Thanks! Pinned! Yum these sound fabulous! Thanks for linking up to Merry Monday! Sharing on our MM Pinterest board! Have a great week!